Welcome to this year's 21st issue of DistroWatch Weekly! As the network of Fedora download mirrors synchronises with the main server to provide us with a speedy delivery of "Goddard" later this week, it's time to take a look at the new version of one the most prominent Linux distributions available today. A full review of Fedora 13 is scheduled for next week; in the meantime take a look at the news section where a linked article discusses some of the best features of this release. Also in the news, a new version of OpenSolaris is rumoured to arrive before the end of the month, PCLinuxOS community releases a "FullMonty" edition with thematic virtual desktops, Debian announces further delays in freezing "Squeeze", and Ubuntu hints at some of the innovations in the upcoming "Maverick Meerkat". This week's feature story is a first look at NimbleX, a live CD that allows you to customise the system before downloading it, accompanied by an interview with the project's founder, Bogdan Radulescu. Other topics covered in today's issue include an explanation about SELinux, the usual recap of the distribution releases of the past week, and an introduction to FuguIta, an OpenBSD-based live CD developed in Japan. Happy reading! 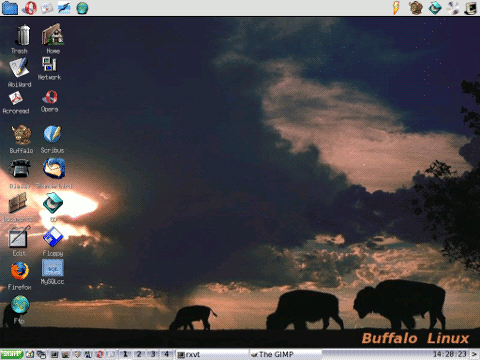 NimbleX, based on Slackware Linux, is a project which attempts to provide a small, yet fully functional, desktop operating system for people on the go. 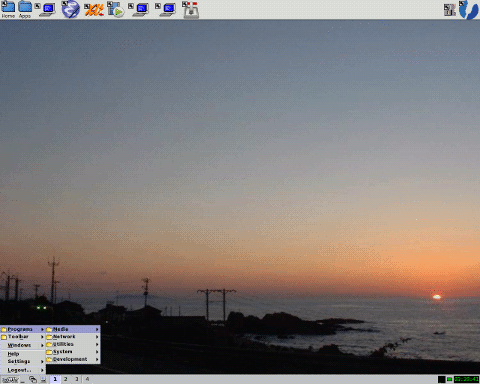 Specifically, NimbleX provides a modern KDE desktop on a live CD or Flash drive. The project also provides a tool called Custom NimbleX, which allows the user to customize their ISO image prior to downloading it. Before taking NimbleX for a test drive, I had a chance to talk with Bogdan Radulescu, creator of the distribution. DW: Could you please start off by telling our readers a little about yourself? Where are you from and how did you get interested in Linux development? BR: Hmm, a little bit about myself. This is a hard one. I will assume you want to know what I like and what I do so I'll go ahead with that. I am from Bucharest and my interest with Linux started a while ago but at some point in 2005 I decided that most distros out there didn't exactly fit my needs so I started to work on my own. I put it on the Internet and some people started to use it, so I didn't stop working on it and eventually it became a distro project. Along the way I found out I really like doing customized Linux solutions for various purposes and/or devices and if I can keep on doing this for a living, things would be pretty good. I like to travel both for work and pleasure when I have the chance. I like all the normal stuff other people like such as hanging out with friends, beer, movies, music, documentaries and some stranger things such as modifying my TV firmware, building my own appliance which does whatever comes to mind, reading documentation and working on the distro. DW: Please tell us why you created NimbleX. What does it bring to the open source community? BR: I think I've already answered how NimbleX started. I'm not sure what it brings to the open source community. I only do it because there are people that like to use it and I can tell you what are some of the things I've heard they like. They say it's faster than most of the other distros with KDE. Some say it just works for them and their hardware. My goal is to make it fairly quick, easy to use, with good hardware support and a software mix that should satisfy people. Also in the past I've added some interesting features which were not easily available out there such as network boot, Custom NimbleX and others. I'm not trying to make NimbleX for everybody because I believe everyone should use whatever they like but I'm always trying to make it better so feedback is always appreciated. 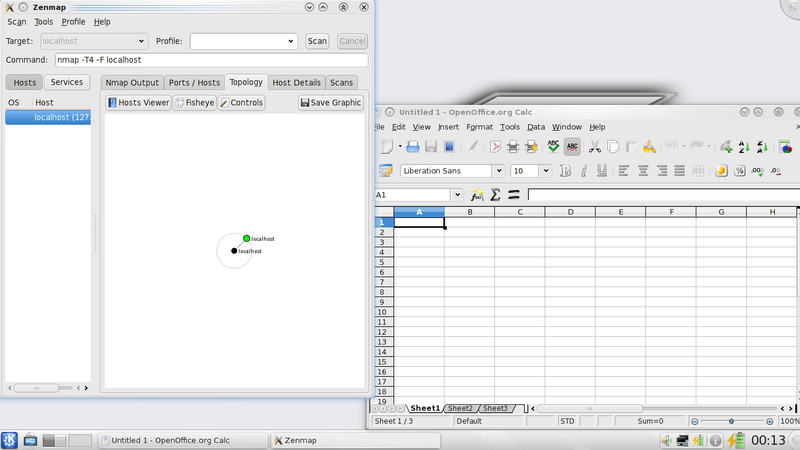 DW: The download image for NimbleX is fairly small, yet it comes with KDE and an office suite. How do you decide what makes it into the image and what is excluded? BR: It's hard to say how exactly I decide because there are many factors. I guess most of the time I take into consideration the ratio between size and usefulness of something before adding it to the distro. Also, there is a lot of removing of any unneeded things from packages and components to keep the size down. DW: Could you tell us a little about Custom NimbleX? It appears to be based on an older version of NimbleX, will it be updated with the 2010 release? BR: The plan is to have it based on NimbleX 2010 at some point. Actually there is an ongoing effort into that direction. I am working with a friend, Florin Bera, who is good at Java and Flex development so the end result will be a Custom NimbleX that should be easier to extend and more browser friendly. The main problem is that we have too little time to wrap it up because we also have to work for money. DW: How many people are working on NimbleX? BR: I am working on NimbleX and on Custom NimbleX it's Florin and me. I would really like this project to have more people involved because there's a lot to be handled. DW: The manual says NimbleX will only install on a hard drive where Windows or GRUB is present. Has that changed for the 2010 version? BR: The installer so far was good enough to put it on a Flash drive which was actually the main purpose of the distro. The reality is that many people wanted to use it on the hard drive but there wasn't a good solution for that so I know it's something that should be fixed. Currently NimbleX 2010 was just released as a beta and the installer was not included in it. It's too early to tell how things will be in the final version. I can only hope I will find the resources to make the installer a little better. DW: Your operating system is based on Slackware. What sort of features does NimbleX offer over plain Slackware? BR: I like that Slackware doesn't make strange things with packages as I've seen in some of the other distros and I like that Slackware is meant to be a pure Linux that doesn't bring very specific tools. Thus far it has been a very good starting base for NimbleX which works as live Linux under the hood. The way NimbleX works means that you can't really break it. Even if you decide to save the changes in a file or in some other way, if you delete the whole /usr directory, at next reboot you'll still have everything there. If someone chooses to save changes and overwrites important files with something not OK, just deleting the changes will bring back a system that worked exactly as it did when it was installed. DW: Is there anything else you'd like to share? Comments about the project or open source in general? BR: I know NimbleX is far from perfect but there are many aspects to a Linux distro. Besides the ISO image there are many more things which have to be handled such as testing, preparing packages, adding features, supporting the community, writing good documentation, web site, graphics and so on. If someone is interested to contribute don't be shy. Also, I'd like to thank everybody who is doing their part on an open source project and all the people that enjoy using it. Aside from these, there is also a service built into the web site called Custom NimbleX, which allows the user to pick and choose which packages should be included in the ISO image. Put together, the project offers quite a bit of flexibility before we even get to burning the disc. For my experiment, I grabbed the 2010 beta. The CD begins with a boot screen which allows the user to boot normally into a live KDE desktop, boot to a text console or try to run from whatever is currently on the machine's hard drive. 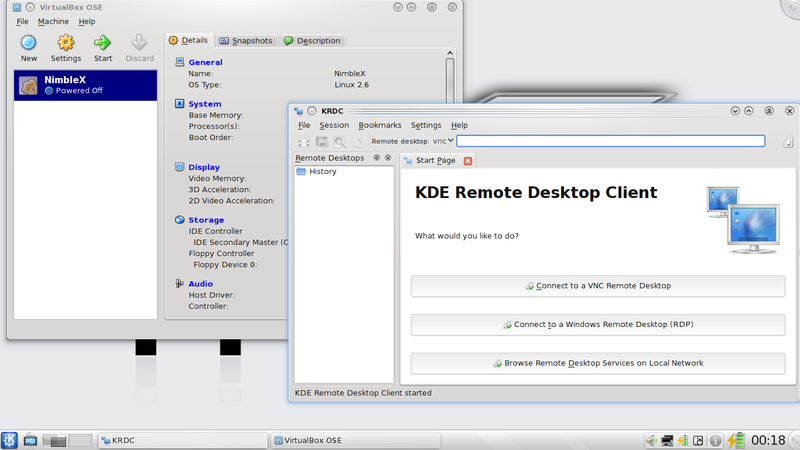 Selecting the default (KDE) option causes the CD to boot into a KDE 4.3 environment. The theme is a combination of white and grey and the desktop is icon-free. The application menu, on the other hand, is packed with a wide range of desktop software. Packages tucked into the 420 MB image include the GIMP, OpenOffice.org 3.2, Firefox 3.6, an image viewer, BitTorrent client, a port scanner, instant messaging client, e-mail client, an audio player, a video player and a suite of KDE games. There's a CD ripper, disc burner, GParted for managing disk partitions, VirtualBox, an archive manager, encryption tools (including KGpg), text editors, calculator and WINE. There are also some KDE development tools, though the GNU Compiler Collection isn't included on the CD. NimbleX also comes with popular codecs for playing videos and listening to music and a Flash browser plugin. For people who want access to additional software, NimbleX has a repository of extensions, or modules, which can be downloaded from the project's web site. The repository has a good collection of software, organized into categories, such as "office", "games", "security", "development" and "drivers". The user also has the option of searching for software by name if they're uncertain of the category. During my test run with NimbleX, I downloaded a handful of modules, unpacked them and found they all ran without any problems. There is a trade-off with packing all of these packages into 420 MB and it seems NimbleX removes more traditional pieces of the Linux system in order to add modern tools. For instance, the default install has no man pages, compiler or vi editor. The 2010 beta doesn't include the system installed either, which appears in the latest stable release. Security was a mixed bag. On the one hand, NimbleX doesn't run any network services by default. However, the live CD logs the user in automatically as root and mounts all local drives. While convenient, this strikes me as an accident waiting to happen. There doesn't appear to be any graphical package updater, software needs to be installed and updated from the command line. NimbleX uses the slapt-get program for software management. On my first attempt to run slapt-get, I found a problem with the program's configuration file. With that fixed, slapt-get was able to connect to repositories containing Slackware 13 packages. I ran NimbleX on two machines, a generic desktop PC (2.5 GHz CPU, 2 GB of RAM, NVIDIA video card) and my HP laptop (dual-core 2 GHz CPU, 3 GB of RAM, Intel video card) and I found the distribution's hardware detection to be about average. There were no problems with the desktop machine, sound worked out of the box, my screen was set to the correct resolution and my network was detected. On the laptop, my video card was handled well, sound worked without any configuration and my touchpad worked as expected. However, my Intel wireless card and Novatel mobile modem were not picked up. Performance on both machines was excellent for a live CD and I found the KDE desktop to be very responsive. I experimented with NimbleX in a virtual machine and found the experience to be good with as little as 512 MB of RAM. Below that point the CD became increasingly sluggish. Using this distribution provides an unusual combination of experiences. For instance, I find it interesting to have a modern KDE environment with shiny desktop widgets running at the same time as I'm manually downloading modules and installing them from the command line. I'm a bit concerned by the way everything is mounted and I can browse file systems and there's no non-root account. There are other little things. For instance, the KDE menu doesn't have a shut-down option. The user can either hit the physical power button or log out of the desktop, which drops the user to a console login screen. Perhaps it's a matter of perception, but I often felt like I was moving back and forth between a very polished, modern distribution and a more primitive creation, making it hard to tell who this distro is targeting. The combination of pre-installed copies of VirtualBox and WINE make me think NimbleX is for people who do cross-platform work, but then there's no compiler nor man pages. The office suite and codecs appear to be for the benefit of an average end-user, but then there's no hard drive installer. So while NimbleX is interesting and fun, even, to use, I'm not sure what niche it fills. What I find it really boils down to is that NimbleX is fast, it's modern and has a great supply of desktop software pre-installed. It's a good tool to have on a Flash drive either for the ease of taking your operating system with you on the road or for trouble-shooting. I really like the Custom NimbleX feature, it's a concept which is steadily becoming more popular and I hope more distributions follow it. The ability to build an ISO file prior to downloading it is a great time saver, especially for people on slower connections. Though there aren't a lot of extensions on the project's web site, the selection covers a wide range, which will fulfil the needs of most users. On the other hand, I really missed having an installer during my trial and I would have preferred to have been logged in as a regular user. If the developers manage to get a hard drive installer put together for the final release, I think NimbleX 2010 will be well worth running as it demonstrates how well a KDE distro can perform. A new release of Fedora is always a highly anticipated event on the Linux distro calendar and this week's arrival of version 13 will be no different. What innovations can we expect to find in "Goddard"? For those readers who have missed all the excitement of testing the preview releases, here are the five best things coming in Fedora 13, according to Steven J. Vaughan-Nichols: "When Fedora 13, Goddard, is released on May 25, it's not going to be your usual Fedora release. In the past, Fedora has been seen as a great Linux distribution for Linux experts. Paul W. Frields, the Fedora Project leader, told me though that this release is more new-user-friendly and that is no longer just for experienced Linux users. Based on my early look at this Red Hat community Linux distribution, I agree. You will be able to see it for yourself soon. After several delays, Frields has no doubt that this time, the Fedora final will be available for download soon." The five best features? Professional-level colour management, better printer driver support, improved open-source graphic drivers, improved KVM virtualisation support, and faster boot. Another release that could be coming to a download server near you at any moment now is the long-delayed new version of OpenSolaris. Although Oracle, the new owner of the open-source operating system, continues to keep absolute silence on the matter, there are some indications that maybe the new release is not too far away. A lengthy document entitled "What's New in OpenSolaris 2010.05" (note the version number change from the earlier 2010.03) briefly appeared on the OpenSolaris web site (it is still available in Google's cache) before it was moved back to its original location - What's New in OpenSolaris 2010.03: "OpenSolaris 2010.03 is the latest release of the OpenSolaris Operating System, a powerful and complete operating environment for users, developers and deployers. OpenSolaris prides itself on being a secure, stable, and highly scalable system. The OpenSolaris OS is open source software and freely re-distributable, and provides all the tools users expect from a modern computing environment. Additional software can easily be installed from online network package repositories." The document talks about some of the user-oriented features, such as the GNOME 2.28 desktop, X.Org Server 1.7.4, improvements in the Image packaging system and the OpenSolaris package manager, and the usual array of enhancements related to hardware detection and support. 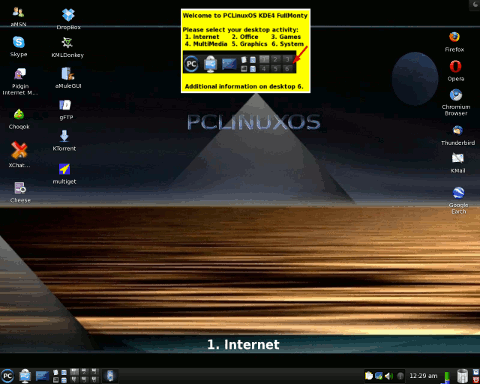 The developers of PCLinuxOS recently surprised their users by releasing not one, but six different editions based on the included desktops or window managers. Or make that seven. Last week, a post on the project's forum revealed one more - a "KDE4 FullMonty" edition, a 3.6 GB DVD designed for those who expect to find in their distribution four different web browsers and five distinct media players: "The idea of the FullMonty concept is to provide the best out-of-the-box experience in an intuitive, thematically organized desktop setup. FullMonty is designed for Linux beginners and newcomers from other operating system, while Linux geeks may find this edition bloated. The typical user is provided with a cream of the crop selection of activity-related applications available in PCLinuxOS. The most popular ones are easily accessible from the respective virtual desktop and many more applications can be accessed from the PCLinuxOS menu." There has been no official announcement, so it looks like FullMonty is an unofficial "community" edition, but it's built from PCLinuxOS packages available in the official repositories. For those with fast Internet connection here is a quick download link: pclinuxos-kde-fullmonty-2010.iso (3,602MB). The Debian GNU/Linux project is well-known for its released-when-ready release policy, a concept that has earned the distribution a reputation for being one of the most stable and well-tested operating systems on the market. It has also earned the project occasional criticism for lengthy release cycles. Unfortunately, it is likely that these reproaches will once again resurface as Debian's upcoming stable release, version 6.0 "Squeeze", is still a long way before becoming stable: "Adam Barratt and the release team sent out an update on the status of transitions, release critical bugs and a timeline of the Squeeze freeze. In short, we have a way to go before Squeeze is frozen and it is difficult for the release team to estimate when Squeeze will get frozen. Adam writes: 'In order to help us keep a clearer picture of which changes still need to occur before we can freeze, we will be introducing a 'transition freeze' before the end of this month." The release team is already working on some transitions now, like Qt 4 and gnome-desktop, which are finished. 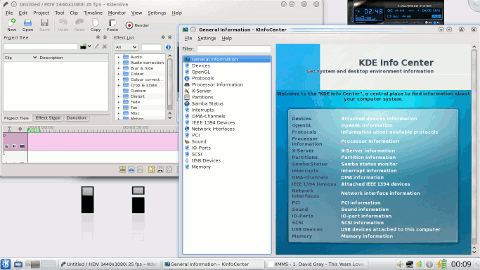 The KDE team is working on KDE 4.4 with the goal of having as up-to-date and stable version of the KDE suite as is possible." In other Debian-related news, Petter Reinholdtsen tells us that parallel booting is now enabled by default in the unstable branch (will move to testing soon), while Raphael Hertzog announces important recent changes in dpkg, the distribution's package manager. Speaking about future releases, some early information about Ubuntu 10.10 "Maverick Meerkat" emerged from the recently concluded Ubuntu Developer Summit in Brussels. Among them is the possibility of switching to Btrfs as the default file system and the introduction of GNOME 3.0: "It seems possible Btrfs could replace ext4 as the default file system in Ubuntu version 10.10. Developers attending last week's Ubuntu Collaboration Summit in Brussels discussed testing Btrfs as the default file system in an alpha version of Ubuntu 10.10. Ubuntu Developer Manager Scott James Remnant assessed the likelihood of switching to Btrfs as 'a one in five chance'. If Btrfs were to become the default in Ubuntu 10.10, this would be the second time the default file system had changed in less than a year. Ext4 was elevated to the default in Ubuntu version 9.10 - six months later than planned. The desktop is also set to change, with Ubuntu 10.10 slated to include GNOME 3.0, although the new GNOME Shell is not expected to be included. 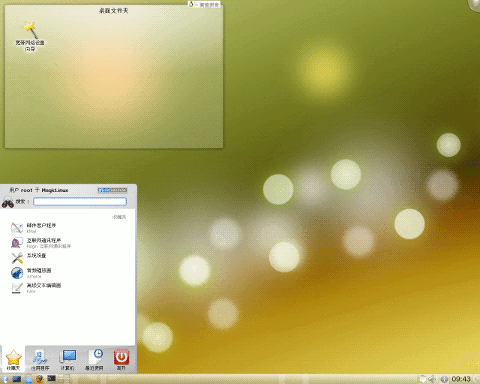 According to Mark Shuttleworth, GNOME Shell will initially be included in daily builds for testing, before discussion of its possible inclusion in Ubuntu 11.04. 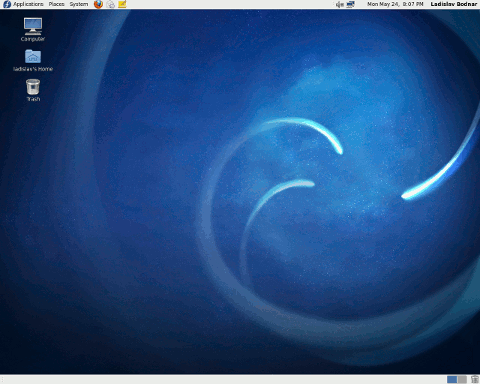 However, GNOME Shell will be installable from the Universe repository in Ubuntu 10.10." Rumours and speculations about the possible sale of Mandriva were given a new twist last week when Gaël Duval, the distribution's founder and current CTO of Ulteo, noted (blog post in French) that Novell could be another party with interest in the troubled French Linux company. He links to this article by L'informaticien (also in French) which has talked to John Dragoon, Novell's senior vice president and chief marketing officer. This is the (translated) reply: "Some aspects of the Mandriva company are interesting, for sure. We have great respect for their technology, although that's not really what interests us. What would be more worthwhile for us is its installed customer base." However, the article concludes that Novell is unlikely to bid for Mandriva as it is currently distracted by trying to resist an (inadequate) takeover bid from one of its main shareholder, while offering itself for sale to as many as twenty other potential buyers. Locking-it-down asks: Can you explain it in simple terms? How do I use it? Traditionally on a UNIX (or Linux) system, a user has access to all of their own files and can run most programs, but can't change things on the system at large. That is, a normal user can't install new programs or change configuration files which will affect other users on the system. Now, a (security) problem with the traditional system is that any program a user runs has the same permissions and access as that user. So if you run Firefox, your web browser has access to all of your files and can, in theory, run the same programs you can run. Which is all well and good if Firefox behaves, but what if you visit a malicious website and Firefox gets hijacked? Then you probably don't want your web browser to have full access to your Tax_Return folder or the ability to change the script that runs when you log in. The question then becomes, how do you limit what a program can do once it has been run by a user? SELinux is one of the answers to that question. This is where the kernel comes into our three-part model. SELinux works in the kernel to make sure programs, and users, only have access to the things they need. Following our example, you might use SELinux to ensure Firefox can only access its own configuration files, your bookmarks and your Downloads folder. Things like your Tax_Return folder, login script and your e-mails can be marked as off limits. So how does it work? Well, each resource on your system is given a label. The label is then used to write a rule, called a policy, saying what programs can access which files and how. This means that even if one of your programs is compromised your system may still be locked down because the kernel knows what the program is, and is not, allowed to do. As to how you can use SELinux, that will vary a little from one distribution to the next. The configuration tools and package names will be different and so it's hard to cover here. If you'd like to experiment with SELinux, then I recommend trying it via the Fedora project. Fedora has supported SELinux (and enabled it by default) in their distro for several years now and they've got a good collection of GUI tools to help build SELinux policies. They also have some of the most complete documentation on the subject here. Though some of the documentation is Fedora-specific, much of it will work on other distributions. Dieter Plaetinck has announced the availability of an updated set of Arch Linux installation CD images, version 2010.05: "New installation media are available. There are fewer of them and they are smaller. But they can do more. Notable changes: all ISO files can now be burned onto CDs as well as written to media like USB sticks; more than half of the packages in core are now xz compressed; next to the single architecture images we provide dual images which can be used as 32-bit or 64-bit medium; use isolinux bootloader exclusively for booting the live media; snapshot of current core, including Linux kernel 2.6.33.4, Pacman 3.3.3 and glibc 2.11.1; updated Memtest86+; support for PXE booting; provide wpa_supplicant; support virtio...." Read the rest of the release announcement for more details. Magic Linux, one of the oldest surviving community distributions in China, has released its version 2.5 after at least 7 development builds. Major components of this release include Linux kernel 2.6.30.10, X.Org Server 1.6.5, GCC 4.4.0, and KDE 4.4.3 (with KDE 3.5.10 also available). The "magic_win" installer now allows Windows users to easily install Magic Linux from a hard disk without much manual configuration. Particular features that may interest the Chinese users include: lightweight but convenient input method "fcitx", WINE emulator optimized for the Chinese locale, powerful video player SMPlayer with good supports for subtitles and sound channels, StarDict dictionary program, various downloading utilities (aMule, KTorrent, MultiGet), instant messaging software (Konversation, Pidgin) supporting various online communications, and special network configuration tools. For more information please check the very detailed release announcement (in Chinese). 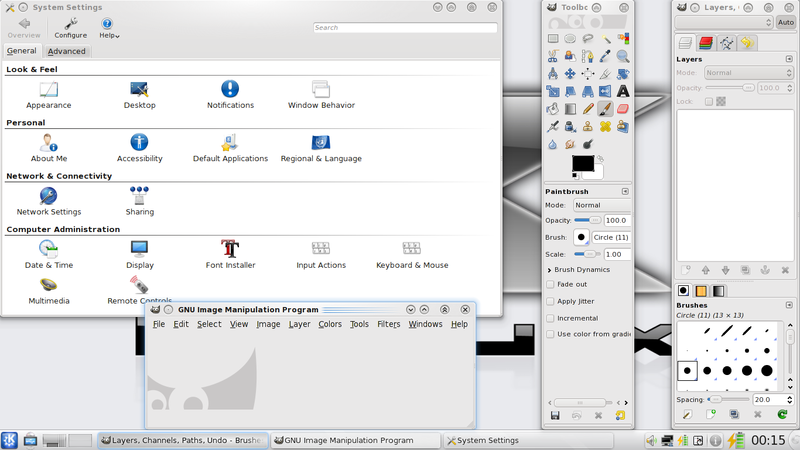 Magic Linux 2.5 includes the latest version of KDE 4. 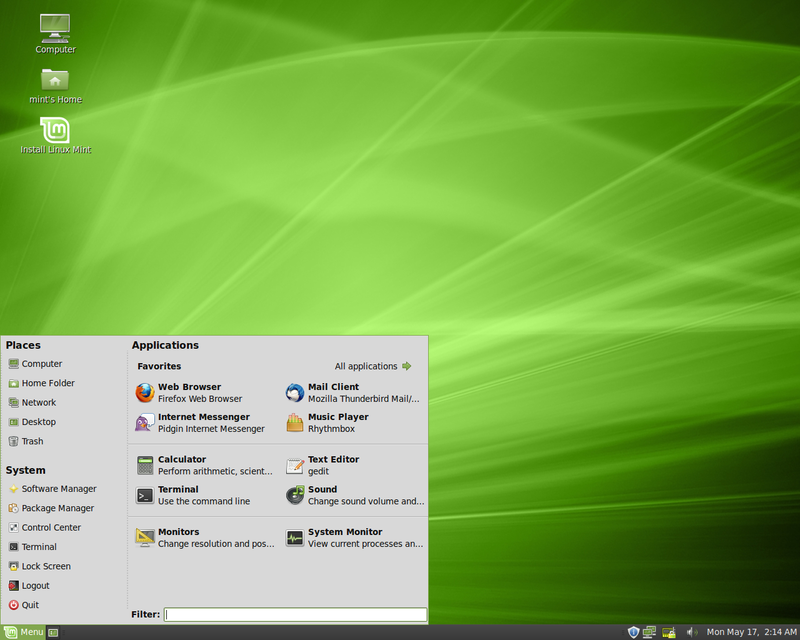 Linux Mint 9, code name "Isadora", has been released: "The team is proud to announce the release of Linux Mint 9 'Isadora'. New features at a glance: new Software Manager - 30,000 packages, review applications straight from Software Manager, APT daemon, visual improvements; new backup tool - incremental backups, compression, integrity checks, backup and restoration of the software selection; Menu improvements - editable items, transparent menu, always start with favorites, 'Add to' shortcuts; desktop settings - changes apply immediately, additional options; better look and feel - backgrounds, welcome screen, update manager; system improvements - Windows installer, Husse quotes, USB Creator, default software selection, local repository and Gnome-PPP, APT hold/unhold/held commands...." Read the release announcement release announcement and visit the what's new page to learn more about the new version. 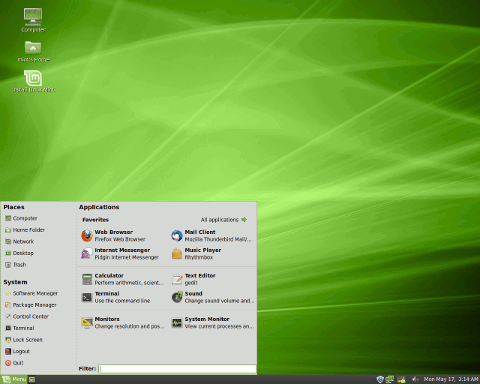 Linux Mint 9 brings a new Software Manager and other incremental improvements. Bob Beck has announced the release of OpenBSD 4.7: "We are pleased to announce the official release of OpenBSD 4.7. This is our 27th release on CD-ROM (and 28th via FTP). We remain proud of OpenBSD's record of more than ten years with only two remote holes in the default install. As in our previous releases, 4.7 provides significant improvements, including new features, in nearly all areas of the system. Install and upgrade process changes: take more care to ensure all file systems are umounted when restarting an install or upgrade; if no possible root disk is found, keep checking until one appears; the default FTP directory for -stable is now the release directory instead of the snapshot directory. Some highlights: GNOME 2.28.2, KDE 3.5.10, Xfce 4.6.1, MySQL 5.1.42, PostgreSQL 8.4.2, Postfix 2.6.5...." Read the detailed release announcement for a complete list of all changes and improvements. Troy Dawson has announced the availability of Scientific Linux 5.5, a recompiled variant of Red Hat Enterprise Linux with extra software packages, hardware drivers and other specialist features: "Scientific Linux 5.5 has been released for both i386 and x86_64 architectures. We have added gnuplot 4.2 as well as the iwlwifi 6000 ucode (firmware). 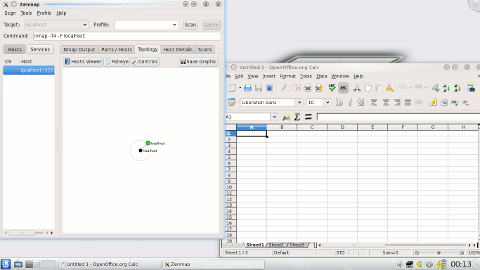 The upstream vendor has also added FreeRADIUS 2 and PostgreSQL 8.4, as well as updated OpenOffice.org to 3.1.1. Scientific Linux release 5.5 is based on the rebuilding of RPMs out of SRPMs from Enterprise 5 Server and Client, including Update 5. It also has all errata and bug fixes up until the morning of May 18, 2010." Read the release announcement and release notes for a more detailed list of changes. SystemRescueCd, a Gentoo-based live CD containing utilities for hard disk management and data rescue tasks, has been updated to version 1.5.4. From the changelog: "Updated alternative kernels to 2.6.33.4 (altker32 + altker64); updated standard kernels to 2.6.32.13 (rescuecd + rescue64); updated FSArchiver to 0.6.10 (fixes several bugs); updated GNU parted to 2.2 with patches from Ubuntu 10.04; updated Memtest86+ to 4.10; updated firmware package to 20100430; disable NetworkManager when PXE / network boot options are used; fixed problem with firmware files in initramfs; fixed the pxe-boot-server service (empty directory was missing); added NetworkManager to make network configuration easier (especially wireless); print name of kernel modules before they are loaded at start-up...."
Glenn Cady has released a special "Gamers" variant of Ultimate Edition 2.6, an Ubuntu-based live DVD with a large number of ready-to-play games: "Ultimate Edition Gamers has been around for some time; however, this is the first time a page has been written for it. Our latest release 2.6 was built by Benjamin Breeg; he intends to make a PS/3 Ultimate Edition. Ultimate Edition Gamers is built off Ultimate Edition 2.6 with all updates pre-installed and a few games also pre-installed for your convenience: Urban Terror and extra maps, Aisleriot Solitaire, Atomic Tanks, Battle for Wesnoth, Boswars, Chromium B.S.U., Gbrainy, Glest, Gridwars, Mahjongg, Mines, Neverball, Play on Linux, Quadrapassel, Scorched 3D, Suduko, Warzone 2100." Read the rest of the release announcement for further information, screenshots and a video showing the live DVD in action. FuguIta. 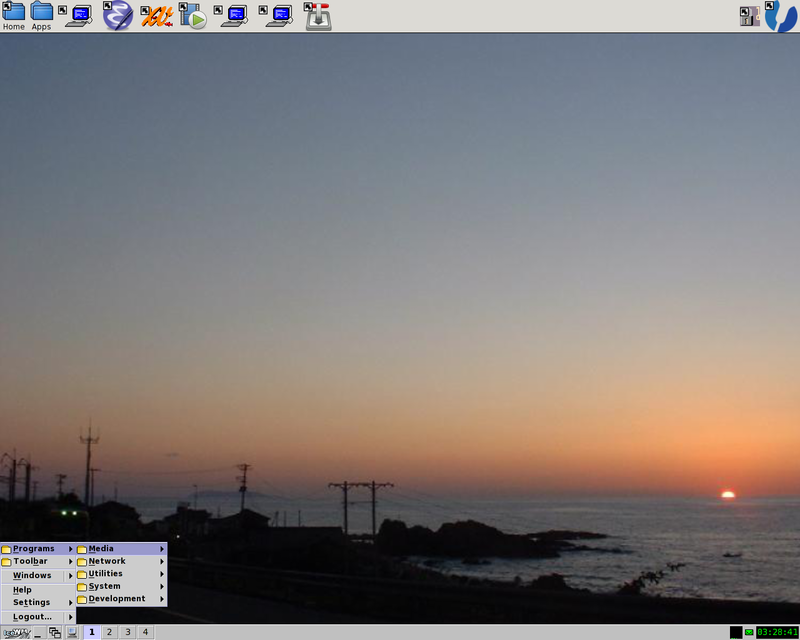 FuguIta is an OpenBSD live CD featuring portable workplace, low hardware requirements, additional software, and partial support for Japanese. This live CD is intended to be as close as possible to the default OpenBSD when installed on a hard disk. This concludes this week's issue of DistroWatch Weekly. The next instalment will be published on Monday, 31 May 2010.